Diamonds are forever and Pearls are timeless, and together they are a classic combination that never goes out of style! From Coco Chanel to Audrey Hepburn to Princess Diana, the pearl earrings with diamonds combination has a long history of decking up the prettiest of women to ever grace the earth. And we can’t blame them. So why should you be deprived of attaining this exquisiteness? Gone are the days when it was thought that these stones could only be worn by the affluent. Pearls and diamonds are making a comeback thanks to contemporary celebrities and style gurus. Interestingly, pearl earrings with diamonds can be worn consistently by women of all ages and can easily be paired with almost all outfits. Thus, they have triggered a massive appeal to women from all walks of life. Find out how you can wear them and discover some wonderful designs from our pearl earrings collection. The elegance and simplicity of pearls are complemented by the shimmer and shine of a diamond. It is the holy union of the products of the earth and the sea. Together, they form a beautiful melody of old-school charm with a touch of modernity. As poetic as it may sound, it is possible to mess up this combination. Both the stones are bold fashion statements and there are more ways than one to pair it incorrectly. Remember, these stones are almost opposite in nature, while the pearl is down-to-earth and sober, the diamond is no-hold-back glamorous. Thus, having both these stones compete will result in a chaotic mess. Therefore, one of the stones becomes the focus of the jewelry piece while the other acts as supporting accessories to make it look even more appealing. Do the Different Colors Make a Difference? Yes! And this decision, based on color, is not just limited to pairing with your clothes! Pearl earrings with diamonds can make your skin glow and you can pick a color that will suit your complexion. Select a pearl with a rosy tint if you have pale skin. Conversely, if you have tanned skin, opt for a bluer tinge in your pearl. White pearls can go well with almost all skin tones and types, thus, making them your safe bet. The radiance of your skin will be further accentuated by the glimmer of the diamonds. Basically, if you wear this combination of pearls and diamonds for a dinner date, you will figuratively exude the illumination of soft romance. Beyond the color of the pearls, the color of the metal in which the pearl and diamonds are set can also make a difference. If you wish to achieve a modern and edgy vibe then pick up a pair of earrings that are set in silver or platinum. Like the Lilian set, for example, which looks even more futuristic due to its geometric shapes and design. For a more traditional look, yellow gold is the metal that will give that vintage expression. To look mature, you can opt for an earring in the golden hues. When Can I Wear My Pearl Earrings with Diamonds? 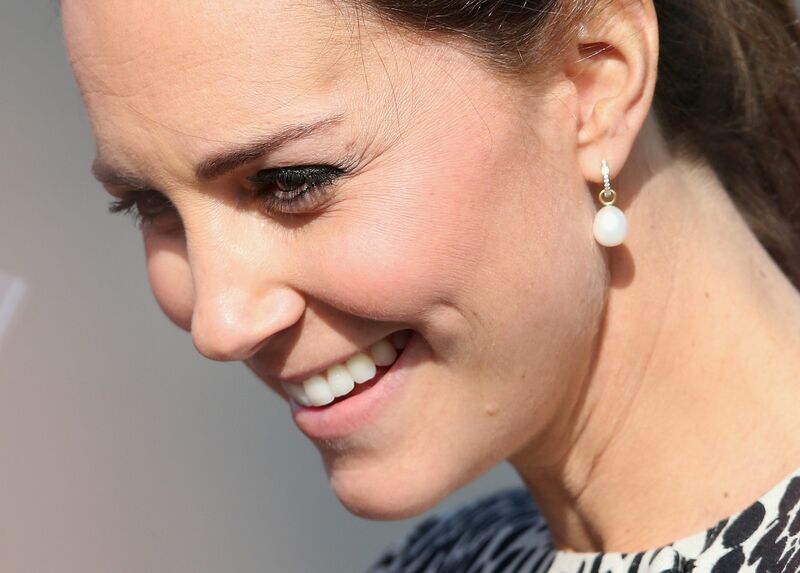 Women generally prefer to use pearl earrings for formal events and business meetings. Pearl earrings with diamonds can be paired with almost all business attires. If you are aiming for an eternally classy look, the Ivana Earring Set will never let you down. The white south sea pearl with diamonds set in yellow gold is a safe choice whether you are attending a boardroom meeting or giving a presentation. If your wardrobe contains mostly black clothing, then you can never go wrong with the Seductive set that contains black Tahitian pearls and 9 sparkling diamonds. White and gold themes are fairly common at most weddings so the safest option would be white pearl earrings with diamonds set in gold. If you are the bride, then you can choose something more glamorous like the chandelier-style dangling pearl and diamond earrings. Formal events like a fancy black-tie party could be a make or break occasion for someone hoping to make a killer first impression. Black and white pearls would match up with almost all your outfits. For a splash of color that would suit your pastel cocktail dress, try out the Rozene Earring Set having pink freshwater pearls. Colorful pearls like Pink, Lavender or Golden pearls go well with most evening gowns and can make your face and skin look exotic. Ensure that the nuance of outfit should harmonize with the shades of the pearl. It is important to strike the perfect balance between a color that would go well with your skin tone and also your clothing. Not just full-length evening gowns but also your trusty little black dress starts looking better with pearl and diamond earrings as its accessory. When it comes to informal events or daily wear, where you are dressed up mostly in your casuals like jeans and t-shirt, you can put on some studs like the Francine Earring Set. For a more pleasing look, the color of your pearl studs should match the shade of your jacket or heels. While heading for a date, do not forget your no-frills pearl studs with diamonds to sweep your date off their feet. What Should Be the Earrings’ Size? You want the world to know that you wear jewelry but that does not mean that the jewelry should wear you. It is important to consider your body proportions while picking out pearl earrings with diamonds. If you are a tall woman with an elegant long neck, you can try pearl drop or chandelier earrings. Choosing something small will just make it disappear or worse, it will make you look even more slender. On the other hand, studs work well for those who have a petite build, check out the Catrina Earring Set to be wowed. Heavy set women should also select tiny studs to make them look less stocky. Should I Wear Something Else with My Pearl Earrings with Diamonds? The answer to this question heavily depends on the kind of earrings that you have worn. Basic pearl earrings with diamonds pair well with a similar pearl or diamond necklace. To have a more visually balanced appeal, choose a necklace or a pendant that has a shape similar to the earrings. Avoid the hassle of matching sizes by simply purchasing a set that contains a necklace, like the Kelly set. However, if the necklace is meant to be the centerpiece, then you may choose a larger and more intricate necklace with small, basic earrings. In fact, if necklace must gain the spotlight, find something plain and simple like the 12-13mm AA+ Quality Freshwater – Edison Cultured Pearl Earring Pair in White. The beauty of pearl and diamond earrings is that they come in various shapes and sizes. If you wish to put your earrings all out there by adorning some detailed and elaborate earrings, then you can skip the necklace entirely. The glamorous earrings can enjoy the attention without any competition from a necklace. As they say, if you’ve got it, you should flaunt it. So why should the story be any different when it comes to your pretty, elaborate earrings? That being said, most pearl earrings with diamonds can be comfortably paired with bracelets or rings that will complement the jewelry. So that is all that you need you to know before you put on those pearl earrings with diamonds. As you may have noticed, it is not a very difficult task to pull them off. Fortunately, the earrings go with most outfits and can add a touch of class to any look, whether formal or casual. From dates to parties to meetings, these earrings will be your faithful companions. Now, if you do not own a pair of these handy earrings, we highly recommend that you do because that’s a purchase that you will definitely not regret. In fact, these versatile pieces should have been a staple in your jewelry box, like yesterday!